"Since its invention in the 1960s, the laser has evolved from 'a solution looking for a problem' to a tool becoming indispensable in many application fields, spanning multiple industries,” explained Royce Lee, Sales Director of Consumer Electronics Industry, Laser Technology, TRUMPF. “Advances in laser technologies ranging from power scaling to ultra short pulse technologies and cost per watt reduction has further accelerated the adoption of this technology in many areas." Trumpf, Coherent, Hans’s Laser and more are part of the 1st Executive Forum on Laser Technologies, taking place from 6th to 7th September 2017 in Shenzhen, China, alongside the 19th China International Optoelectronic Expo 2017. Powered by Yole Développement (Yole) and CIOE and supported by EPIC, this conference proposes a powerful programme focused on laser technologies and market trends. Under a dynamic context investigated by Yole’s analysts, many technical issues, business opportunities, and emerging applications have been identified. Laser technologies are today undoubtedly present in many industries including the semiconductor industry with applications focused on process manufacturing (dicing – lithography and debonding process steps). What is the status of the laser technologies today? Applications and related market segments, technology challenges, competitive landscape and more will be discussed at the 1st Executive Forum on Laser Technologies. Yole, in collaboration with CIOE and EPIC developed a relevant programme of presentations, Q&A and networking sessions to explore this industry. “The 1st Executive Laser Technology Forum is a market and technology focused programme,” announced Eric Yang, Vice General Manager at CIOE. “Because of the leading market positioning of companies based in South China, especially involved in laser micro processing applications, both partners Yole & CIOE naturally decided to set up the Laser Forum in Shenzhen, China. This collaboration is showing the growing adoption of laser technologies in numerous industries, for lot of applications. Laser Forum is a unique opportunity for industrial players to learn more about the technologies status and meet related experts”. The laser forum will bring together an excellent panel of manufacturers, integrators and users experts. The aim of this exciting programme is to allow participants to get valuable insights into the status and future of the laser industry as well as provide opportunities for meeting with industry leaders. Over the course of one and a half days, the programme will address laser emerging applications and key markets, new technologies, and future trends. 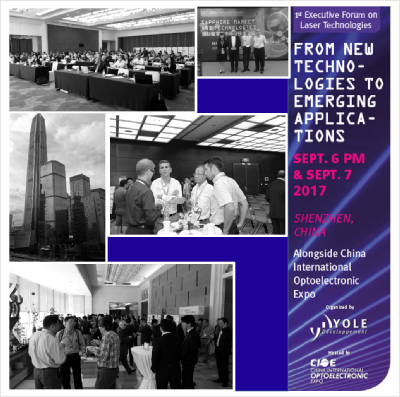 Yole & CIOE forum is a must for all laser industry executives as well as for manufacturers, integrators and users managers to network and learn about all the latest industry trends.